An academician, nature-lover, eco-critic and a researcher, Ms. Archana Kadiyan, M.A. in English Literature is presently a Doctoral student in the Department of English and Foreign Languages, Maharshi Dayanand University, Rohtak, Haryana, India. Her PhD thesis entitled “Ecological Footprints in Literature: An Excursion through Selected Nature Writings and Nature Novels” is a well-oriented research in the field of eco-criticism. 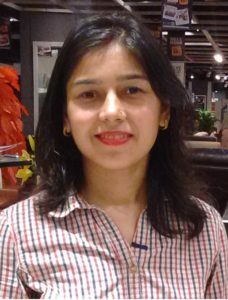 She has worked as an Assistant Professor of English in three institutions namely, Maharshi Dayanand University in Rohtak, D.A.V. Centenary College in Faridabad and Amity University in Gurugram, Haryana, India. She has written five research papers in national/international journals. She has actively participated and presented papers in dozens of national/international seminars/conferences. Her areas of specialization are Eco-criticism, Studies in Nature Writing, Post-colonial Literature, Critical Studies, American Literary Studies, Indian Literature in English, and British Literature. Since her childhood, she has been a close observer of Nature and is deeply inspired by its beauty and diversity. She has a keen interest in reading and analyzing books, poems and novels especially dedicated to nature. She is an aspiring poet, painter and writer. She loves to work for the conservation and preservation of precious natural resources. She has been appointed as one of the Executive Council Members (ECM) of FSLE-India of its Haryana Region.